It was a split decision for a 38-unit affordable housing project at the former Midas site on Broadway before the Planning Board on Tuesday night. For the second time in less than a year, the Planning Board approved the site plan for the development, a partnership between the Traggorth Companies and The Neighborhood Developers (TND). Late last year, the Zoning Board of Appeals (ZBA) narrowly denied the 42 unit affordable- and market-rate residential development at 1001 Broadway. The Suffolk County Land Court remanded the controversial Zoning Board affordable housing denial on Broadway back to the ZBA with a revised plan. However, the project did not garner the necessary votes from the Planning Board for a recommendation to the Zoning Board of Appeals to grant special permits for the project for parking and lot coverage relief. The project will still come before the ZBA at its April 9 meeting for approval, but if the revised project is to move forward, it will have to do so without the Planning Board’s seal of approval. Four of the six board members who voted Monday night did support recommending the special permits to the ZBA. But given the need to pull in a two-thirds vote of the overall nine-member board, it wasn’t enough to gain official approval of the project. Planning Board members Todd Taylor and Shuvam Bhaumik cast the votes against the recommendation, in large part echoing the parking and larger economic impact of the project on the city. Monday night’s two hour public hearing covered a lot of familiar ground for residents and city officials who have been following the course of the project over the past year. Supporters of the project touted TND’s past successes in providing affordable housing in the city and the continued need to provide more affordable housing units in the city. Those opposed to or with reservations about the development raised questions about traffic and parking, as well as continued development that puts affordable rental units on the market without providing for home ownership opportunities. Representatives from TND and the Traggorth Companies presented their revised plans for the project, much as they had to the ZBA during an initial meeting earlier this month. The major revisions to the proposed $15 million project include cutting the total number of units from 42 to 38, making all the units affordable, and eliminating the fifth story of the building that had been proposed for the Broadway side of the development. The commercial space on the first floor in the initial proposal has also been eliminated and replaced by a community room. The original proposal denied by the ZBA totaled 42 units, with nine of those at market rate. The revised plans cut four units out, and lower the height of the building facing Broadway from five to four stories. A housing lottery will be held for all of those units, with 30 offered at 60 percent of the Average Median Income (AMI) for the area (about $64,000 for a family of four) and eight at 30 percent AMI (about $32,000 for a family of four), according to TND Project Manager Steve Laferriere. The maximum preference allowable under state law will be given to Chelsea residents for the units, Laferriere said. There will be 42 parking spaces for the 38 units (the majority of which will be two-bedroom apartments). And because of state law regulating public access to public waterways, 31 of those parking spaces will be available as public parking from 7 a.m. to 7 p.m. to provide access to Mill Creek for everyone. As with almost all development proposals in Chelsea, traffic and parking are a major roadblock to support for approval. District 3 City Councillor Joe Perlatonda, who represents the area where the affordable housing will be built, said the project at the corner of Broadway and Clinton Street will only worsen a nightmare traffic and parking scenario. While Perlatonda said the city needs more affordable housing, he said it can’t be at the detriment of the many residents who live in the already crowded and congested neighborhood. But for others, including City Council President Damali Vidot, the need for affordable housing units in Chelsea trumps the traffic and parking concerns. Vidot, who said she has almost never supported development in the city, said her main concern about the Traggorth/TND project was its impact on parking. Hahnel said the developers would be willing to consider an agreement where residents would not be eligible to apply for city street parking stickers, thereby helping ease parking congestion in the neighborhood. At-Large City Councillor Roy Avellaneda took a different view of the affordable rental units. While Avellaneda said he is a supporter of affordable housing in Chelsea, he questioned TND’s recent history of developing affordable rental units at the expense of creating affordable home ownership opportunities. Avellaneda said the lack of more affordable home ownership opportunities in Chelsea is pricing out middle income and working families who want to set down roots in the city. Taylor echoed Avellaneda’s sentiments that a lack of home ownership is an issue in Chelsea. A major $9.5 million improvement project for the one-mile stretch of Broadway from City Hall Avenue to the Revere line could get underway by the spring of 2022. On Thursday, March 21, the Massachusetts Department of Transportation held a public hearing on the preliminary design plans for the roadway reconstruction. Although the state officials and engineers outnumbered the residents in attendance for the meeting, there was a good amount of information provided on the shape, scope, and timeline of the road reconstruction project. The purpose of the project is to increase safety for pedestrians, bicyclists, and vehicles along the Broadway corridor and intersecting streets in the city, according to Weston and Sampson engineer Larry Keegan. He said there will be new turn lanes, additional vehicle stacking room, and traffic signals at the project intersections allowing for the safer turning of vehicles and improved safety for pedestrians and bicyclists. The plans also include dedicated bicycle lanes through the one-mile stretch. Keegan pointed to poor intersection layout, outdated traffic signals, and deficient pedestrian, bicycle, and public transit accommodations as being among the chief culprits for the high number of accidents. All of those issues will be addressed during the roadway reconstruction, he said. In addition to the repaving of the road itself, a major component of the work includes new sidewalks and improved drainage. Sidewalk improvements will mean the removal of some trees. “The existing trees are old and unhealthy, lifting up the sidewalks themselves so that they are not ADA (Americans with Disabilities Act) compliant,” said Keegan. Other areas that will get major upgrades are the MBTA bus stops along the route. Keegan noted that there is deterioration of pavement and pavement markings from years of use along the mile of Broadway, and that the deterioration is especially pronounced at the bus stops. The proposed project will require permanent and temporary easements from adjacent property owners, but Cash said those easements are either temporary to allow for construction work along the road, or are for the installation or minor regrading of sidewalks. As with any project that involves ripping up pavement and sidewalks to make way for improvements, there will be traffic and construction impacts once work gets underway. But Keegan said the plan is to keep disruptions to a minimum and traffic flowing as easily as possible. “No detours are anticipated at this time,” he said. During the day, the plan is to have a single lane of traffic closed and have the traffic managed by police. At night, there will be two-way traffic, according to Keegan. Access to schools, businesses, and residences will be kept open as much as possible, he added. Chelsea resident John Gunning asked if the bus stops would remain in the current locations and if there would be improvements to the bus shelters. Keegan said engineers will be working with the MBTA during the next phase of design to address some of those issues. Dunning said he would like to see fresh, new bus shelters and stops that will complement the surrounding area and completed improvements. Cash said design, permitting, and right of way acquisition for the project will continue through 2019 and 2020 with construction anticipated to start in the spring of 2022. A revised affordable housing development at the corner of Broadway and Clinton Street is back before City boards, and now it features fewer units with all at affordable rates. Late last year, the Zoning Board of Appeals (ZBA) narrowly denied the 42 unit affordable- and market-rate residential development at 1001 Broadway (Midas site) in a vote that was based on creating more homeownership opportunities in the City. The project included nine units of market-rate housing and enhanced access to the Mill Creek waterfront. The Suffolk County Land Court remanded the controversial Zoning Board affordable housing denial on Broadway back to the ZBA with a revised plan. Monday night, the revised version of the development, a partnership between the Traggorth Companies and The Neighborhood Developers (TND), was back before the ZBA. The revised plan is an attempt to address the concerns of the board and neighbors, according to Dave Traggorth of the Traggorth Companies. The commercial space on the first floor in the initial proposal has also been eliminated. “We have reviewed the plans based on the ZBA recommendations, and the commercial space will now be a community room,” Traggorth said. The project needs special permits due to a slightly larger than allowed lot coverage, and for not meeting City parking requirements. The Broadway housing will have 42 parking spots, where 52 are required by the city. Thirty one of those parking spaces will be available for the public to access Mill Creek from 7 a.m. to 7 p.m. In addition, Traggorth said the developers will give the city $15,000 for intersection improvements in the area. With the decrease in units and the elimination of the commercial space, TND Project Manager Steve Laferriere said there will be less of an impact on parking in traffic in the area than the initial proposal. District 3 City Councillor Joe Perlatonda, who represents the area where the affordable housing will be built, said he is still opposed to the project, citing a burst of recent development in the city that will increase parking and traffic. Perlatonda said the parking and traffic issues around Broadway and Clinton Street are already a nightmare for neighbors, and that the Traggorth/TND project will only make it worse. He said the City should take a look at other uses for the property, such as a new public library on Mill Creek. But the majority of people who spoke during the public hearing said they supported the creation of sorely needed new affordable units in Chelsea, and praised the efforts TND has already made to create safe and modern affordable units in the city. A recent affordable housing lottery in the city saw more than 3,000 applicants for 34 units, with more than 1,200 of those applications coming from Chelsea residents. “There is a clear need for affordable housing as rents continue to go up in the Chelsea area,” said resident Sandy Maynard. City Manager Tom Ambrosino said he continues to support the TND/Traggorth partnership. “The number one complaint I receive as City Manager from residents is the lack of affordable housing,” said Ambrosino. Ambrosino said he understands the concerns about traffic and parking, but said the impacts of any project has to be weighed against the benefits, and that the benefits of affordable housing at Broadway and Clinton tip the scales in favor of the project. While state law prohibits the developers from offering the affordable units to Chelsea residents only, the developers said they would work to make sure the maximum units allowable are for Chelsea residents. The Planning Board will take up the project at its March 26 meeting, and then it will come back to the ZBA at its April 9 meeting for a possible vote, according to ZBA Chair Janice Tatarka. The City might have to put up with traffic backups for nearly three years on the Chelsea Viaduct, but there will be a mitigation package for the City when the dust all settles. City Manager Tom Ambrosino said they have received a mitigation package to go along with the Viaduct project, which starts on April 1. One of the major improvements will be two new, fully constructed public parking lots under the Tobin curves when the project is done. Ambrosino said it will include 135 public parking spaces just a block from downtown Chelsea, something he hopes will help alleviate some of the parking crunch in the area. There will also be parking constructed under the curves at Carter Street too. One key piece of the puzzle that will remain as part of the package is the Arlington Street onramp by the Williams School. MassDOT had toyed with the idea of eliminating that ramp in early designs, but pushback from the community seemed to keep that idea at bay. •A robust snow fence for noise mitigation. •Money for community engagement to inform everyone of the project over the three years. •Repaving Fourth Street. •lighting improvements under the Bridge after the project is completed. The Forbes Park development proposal, with more than 500 residential units proposed for the former industrial campus, has been approved by the City’s Zoning Board of Appeals (ZBA) after four years and two major re-designs. The final iteration of the project includes 590 units of housing, with 60 percent of those units being condos for sale and 59 units being affordable to a range of incomes. There are also 1.6 parking spaces per unit, or 963 spaces. The project also boasts a major public access area to the waterfront of the Chelsea Creek and Mill Creek. The current project also has a very small amount of retail and office uses, with both totaling below 20,000 sq. ft. The project, though still very large, was scaled back from the developer’s (YIHE Forbes of China) original proposal in 2015. That proposal featured skyscrapers about 21 stories tall and more than 1,000 units of housing accompanied by large office spaces and large hotels. It was rejected informally and the company eventually withdrew during a ZBA meeting that went past midnight. The news of Tuesday’s approval of the new plan was viewed with mixed results by most, including those who had come to support the project, including City Manager Tom Ambrosino. Ambrosino said they also agreed to several affordable housing concessions. Of the required 59 units of affordable housing, the mix will include many different income ranges, including 60 percent of the Area Median Income (AMI), 50 percent of the AMI and 30 percent of the AMI. “That’s really deeply affordable and it assures that actual families that live in Chelsea now will be able to afford to live in the complex. That was very important to the City,” he said. The developer also agreed to contribute $300,000 to the four schools at the Mary C. Burke Complex, which is about two blocks from the Forbes entrance. That said, not everyone was happy with the news – and in particular was Councillor Joe Perlatonda, who represents the Mill Hill and Forbes area. He said the problem with the Forbes project is the same as it has always been, and that problem is the fact that there is one access point. In the first iteration, City officials – including Ambrosino – had called for a bridge over the Chelsea Creek to Revere as a second access point to alleviate traffic in the neighborhood. However, this time around that was not made a requirement, and Perlatonda said he was not happy there was a concession made on that point. GreenRoots Executive Director Roseann Bongiovanni said they didn’t believe the project was perfect, but felt there had been reasonable concessions made about their concerns. Ambrosino said the site is very large, and that did allow the developer to be able to build large numbers of units by right if they chose to do so and could meet the parking requirements. That, he said, would have cut the City and the neighborhood out of the planning completely. He felt it wasn’t worth the risk to chance that. “They could have gone in by right and built 450 units and 900 parking spots and got a building permit without any say from the City or the neighbors,” he said. The project has already cleared Major Site Plan at the Planning Board, but has many hurdles to clear at City Hall in reviewing plans before they can break ground. It is believed that the developer plans to keep three of the smaller buildings on site and rehabilitate them. The rest of the project will be new construction. Much of the public discussion over the Smart Growth overlay district for Central Avenue over the past several months has focused on the technical aspects of the zoning ordinance. But Monday night, as the City Council unanimously approved the Smart Growth zoning – which will pave the way for the Innes Development project to move closer to becoming a reality – much of the talk focused on the human and community benefits of that decision. As the final vote was made official, cheers and applause were heard from Innes residents, project development team members, and even City Planning and Development Director John DePriest. “This will allow for new homes that all the residents of Chelsea can be proud to call their own,” said Ronnie Slamin, the project director for Corcoran, the developer behind the Innes Street/ Central Avenue housing redevelopment plan. The special zoning designation, allows the mixed-income project to have its own, special regulations for parking and density and other requirements. It also unlocks $5 million in state and local funding for the project. Corcoran Development will assist in developing the 330-unit community on the site of the current housing development. Those units will include the existing 96 public housing units, as well as 40 workforce housing units. The remaining 194 units will be market rate, and with the state and federal grants, will subsidize the replacement of the public housing units. Overall, the development would have a 41 percent affordable ratio, which is three times as much as what would normally be required by the City and double the state requirements. For many of the current Innes residents, and for members of the Chelsea Housing Authority, it is a major step forward to replace the current units, which are rundown and decades old. “It is our dream to live in new apartments that are safe and decent for our children, elderly, and the disabled,” said Melissa Booth, co-president of the Innes Residents Association. The Smart Growth overlay district will cover the current footprint of the Innes Development, and puts a premium on affordable housing and access to public transportation. Chelsea Housing Authority (CHA) board member Bertram Taverna said the Innes redevelopment is the kind of opportunity that the City has not seen for decades. CHA Executive Director Al Ewing said the redevelopment will give the city the ability to deliver on its promise of providing a home where residents can be proud to live and raise their families. Council President Damali Vidot said it’s been a long road for the Innes project to move forward. The Council voted down a project three years ago because prevailing wages for workers wasn’t on the table. With prevailing wages now part of the development proposal, the only major issue that gained any traction over the past several months was, unsurprisingly, parking. While the smart growth zoning is one major step towards getting shovels in the ground for the project, developers will be back before the Council for approval of a TIF (Tax Increment Financing) tax break for the project. That is expected to come before the Council later in the spring. Vidot said that parking will be addressed in the TIF. Corcoran is proposing 226 on-site parking spots, with an option to lease another 50 parking spots nearby. The Innes Street/Central Avenue housing redevelopment plan has cleared its latest hurdle with the Planning Board, but will face a critical vote Monday night at Council on whether or not to allow them to have a ‘40R’ zoning designation. The Council will consider the special zoning designation, which allows the mixed-income project to have its own, special regulations for parking and density and other requirements. At the same time, it also unlocks $5 million in state and local funding. The mixed-income development is in partnership with Corcoran Development, which will assist in developing the 330-unit community on the site of the current housing development. Those units will include the existing 96 public housing units, as well as 40 workforce housing units. The remaining 194 units will be market rate, and with the state and federal grants, will subsidize the replacement of the public housing units. Overall, the development would have a 41 percent affordable ratio, which is three times as much as what would normally be required by the City and double the state requirements. It seems like a huge moment for residents like Jean Fulco, who is part of the Innes Residents Alliance (IRA). Resident Melissa Booth, also of the IRA, said she has a special needs child who cannot walk up the stairs, but they live on the second floor now. “I usually have to carry my child up the stairs because there isn’t an elevator,” she said. The new development is slated to have an elevator. But one of the strangleholds in this second go-around of the mixed-income redevelopment – which had to be backed off two years ago – is parking. There are 226 spaces available on site, and another 50 spaces will be located off-site nearby. Council President Damali Vidot said she does support the project, but she also lives in the area and understands that parking is already a mess. She said they have worked out a potential plan where the market rate units will not be able to apply for a residential parking sticker. She said the decision is a tough one for the Council. While many have reservations, they also want to help the public housing residents improve their lives. Over the last several weeks, the IRA and the CHA and Corcoran have been pounding the pavement. They have had coffee hours, done personal outreach and have launched a website. “We are in a competitive process and if this doesn’t get approved for whatever reason, Chelsea will not realize this opportunity,” said Sean McReynolds of Corcoran. Chelsea residents and MBTA officials mingled at the Chelsea Senior Center on Tuesday, February 19, where the MBTA sought community feedback on three new system-wide changes on the horizon: a proposed fare hike, a bus system improvement initiative dubbed The Better Bus Project, and an upgraded program for managing ticket purchases called Automated Fare Collection 2.0. 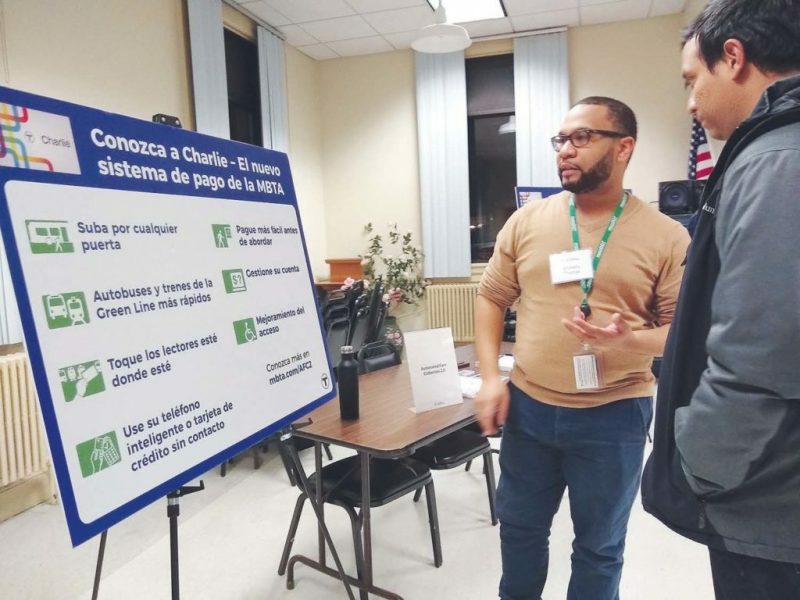 The event was the first meeting in a series that the Transit Authority is hosting in the Greater Boston area throughout February and early March. Other cities and communities on the list include Quincy Center, Woburn, South Boston, Harvard Square, Downtown Boston, Watertown and Worcester. night at the Open House – the first of many in the Greater Boston area dealing with rate increases, the Better Bus Project and the new fare collection system. Departing from the traditional town hall-style meeting, there was no speaker or agenda. Rather, officials from the MBTA were stationed at a horseshoe of tables featuring large informational posters and fliers in Spanish and English. Residents from the Chelsea community were invited to circulate from station to station in order to learn about the proposed changes, ask questions and provide oral and written feedback. The increase, which is aligned with Boston’s inflation rate, also meets the State law allowing the MBTA to raise their rates no more than 7% every two years. The fare hike, which would go into effect in July, would be the first since 2016. The 6.3% increase would be applied to all fares, including bus and subway, commuter rail, ferry, and The RIDE. In terms of the most common fares and passes, a local one-way bus ticket would go from $1.70 to $1.80. A one-way subway ticket would go from $2.25 to $2.40. A monthly LinkPass would go from $84.50 to $90.00, and a 7-Day LinkPass would go from $21.25 to $22.50. Those interested can read more about the proposed fare hike at mbta.com/fare-proposal-2019. Comments can be emailed to fares@mbta.com, or mailed to MBTA, Attn: Fare Proposal, 10 Park Plaza, Boston, MA 02116. Respondents can also share their opinions via an online survey available at surveymonkey.com/r/6TW8FFQ. Another project on the table is The Better Bus Project, an expansive initiative looking to overhaul the entire bus service of the MBTA. Its current projected rollout date is 2020. The Better Bus Project would be comprised of five distinct elements: continuous change, analysis, proposed near-term changes, multi-year investment strategy and the Bus Network Redesign. Continuous change refers to changes that can be made incrementally over time as the opportunities arise. Analysis includes reports generated from a period of outreach in which the MBTA surveyed riders most affected by gaps in service. Proposed near-term changes for The Better Bus Project include 47 specific suggestions for the consolidation of duplicate routes, the increase of space at bus stops and the elimination of some obsolete bus routes. One of the 47 proposed projects is Route 111, which runs from Haymarket through Chelsea to Revere. The MBTA aims to “provide faster and more reliable service to Route 111 by removing service on Park Avenue in Revere, with connection remaining via Route 110,” according to a Better Bus Project flier. A multi-year investment strategy will kick off a dialog about how to best leverage resources to improve the bus system as a whole, taking into account what riders want and need. The ambitious Bus Network Redesign would re-envision the current MBTA bus network in the hopes of better serving passengers. To learn more about The Better Bus Project and share your input, go to mbta.com/projects/better-bus-project. According to the MBTA, passengers will be able to pay their fares faster with improved Charlie Cards, a smartphone app, different payment options and digital fare readers. Under the new system, passengers will be able to conveniently reload their Charlie Cards in a number of venues, from schools and employers, online, over the phone, retailers and an increased number of vending machines. MBTA employee Anthony Thomas explained that people could still use cash to reload their Charlie Cards at a number of locations throughout the city, but that cash would no longer be an option for paying on buses. The idea is to reduce the long bus queues, resulting in faster routes. These changes would not be rolled out all at once, but would overlap with the current technologies available, some of them in place for over a decade. In this way, the MBTA hopes to have a seamless transition to the new system. For more information about AFC 2.0 and to submit your feedback, visit afc2.mbta.com. The Chelsea Cultural Council has announced the awarding of grants totalling $20,809 to 18 local artists, schools and cultural organizations. The grants were awarded from a pool of funds distributed to Chelsea by the Massachusetts Cultural Council, a state agency that supports public programs and educational activities in the arts, sciences, and humanities. The Chelsea Cultural Council (CCC) has also set aside an additional $3,121 to complete a public mural project in collaboration with Chelsea Public School Art Department that began in the fall of 2018. The CCC is one of 329 local councils that serve every city and town in the state. The state legislature provides an annual appropriation to the Massachusetts Cultural Council, which then allocates funds to each local council. Decisions, about which activities to support, are made at the community level by the council. The members of the Chelsea Cultural Council are: Marlene Jennings, Chair; Dakeya Christmas, Co-Chair; Devra Sari Zabot, Recorder; Juliana Borgiani, Treasurer; Sharlene McLean, Angelina McCoy, and Carolina Anzola. The CCC will seek applications again this fall. CCC Guidelines will be available online as well as the 2020 application beginning Sept. 1, 2019 at www.mass-culture.org/chelsea. The deadline to apply is Tuesday, Oct. 15. The people of Chelsea are demanding increased frequency on the Silver Line, more reliability, and additional bus connections from the MBTA. Over the next two years there will be three major construction projects in Chelsea that will adversely impact bus traffic, and City leaders and residents are concerned that the already poor services will worsen. On January 24, Poftak sat with locals and members of the City Council during the first inaugural Chelsea Transportation Task Force meeting at City Hall. The goal of the committee is to gather once a month for six months of interactive discussions with the community and Poftak to develop solutions. Many aren’t content with the massive traffic that builds with the 20 minute rising and 20 minute lowering of the Chelsea Street bridge, which slows bus travel. The MBTA noted that active discussions with the Coast Guard regarding the creation of a period of time during peak hours of commuting when the bridge does not open have been hindered by the government shutdown. “We have limited control over the bridge. Maybe we could have some predictability with windows when we know the bridge will be active and when we know it won’t,” said Poftak. The Better Bus Project is investigating the quality of the current bus network and working on cost-neutral proposals that will result in more frequent services for customers. Researchers have been speaking with riders to learn more about where people’s trips begin and end, the economic demographics of the area, and where jobs are located. The Better Bus Project has 47 proposals for changes in the MBTA bus system that will impact 63 out of the 180 routes in 35 of the 50 communities that are served. Proposals include removing bus routes with low ridership, and re-investing resources elsewhere. The Transportation Task Force is suggesting more inspectors, less cancellations, and easier transfers between Chelsea and Lynn on the Commuter Rail. Gentrification has also forced many Chelsea residents to relocate to Lynn because of the high cost of rent. One Chelsea resident, who works in Lynn, voiced that it takes her up to two hours to commute from Lynn to Chelsea using public transportation. She commented that the only line that directly connects Chelsea to Everett is the 112 bus, and many avoid it due to the lifting of the bridge; and recommended that the 426 bus through Lynn could stop in Chelsea, as it already passes over the Tobin Bridge. “In the overall bus network redesign, people on the north side of the city are particularly interested in going to Lynn and Malden,” Poftak concluded. Better Bus Project proposals will be available at www.MBTA.com with maps and data. The MBTA will also be providing riders with a warm place to view proposals at Haymarket Station, where they see the most response from Chelsea residents.